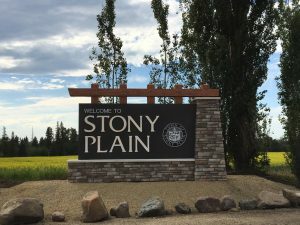 The picturesque town of Stony Plain is located in the province of Alberta, Canada and has a population of 17,000-plus. Stony Plain is famous in the area for its plethora of painted murals around town that depict local historical figures and events (even earning them the nickname “Town with the Painted Past”). They are also well known for their bluegrass and country music festivals held during the later summer months. They’ve also made a statement with two brand-new, strategically placed, custom-designed signs located along the main highway into town that welcome people to the community and complement the surrounding environment. 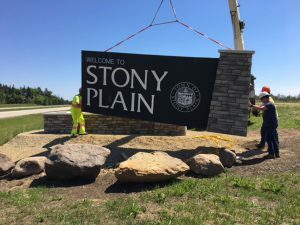 These “Welcome to Stony Plain” monument signs measure 214 inches wide, 134 inches tall, and 43-3/4 inches deep. 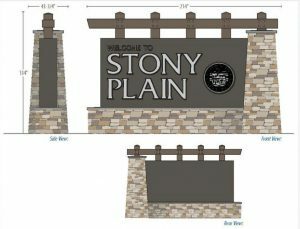 The single-sided signs feature a two-color acrylic stucco finish on the face, as well as a custom Gemini plaque of the town’s logo. 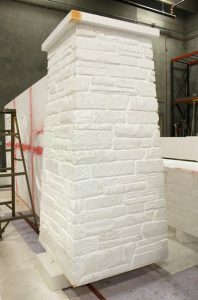 There is an EIFS stone finish on the base and column and a faux woodgrain finish as the top accent. These stunning-looking signs were made a reality thanks to the efforts of Valley Traffic Systems and their collaborative project management with a variety of sign vendors. Valley Traffic Systems has been around for twenty-one years, first operating as a small alternative traffic control company out of a one-bay mini warehouse in Langley, British Columbia. The company has since grown into one of Western Canada’s largest manufacturers and resellers of traffic management services, traffic signage, and other safety-related products, even opening up a second office in Edmonton, Alberta, where Prairie Region Sales Manager Derek Sware is employed. Valley Traffic Systems worked on this monument project for the Town of Stony Plain after winning an open negotiated request for proposal process against four other competitive proposals that was conducted at the beginning of the town’s entire signage strategy implementation. 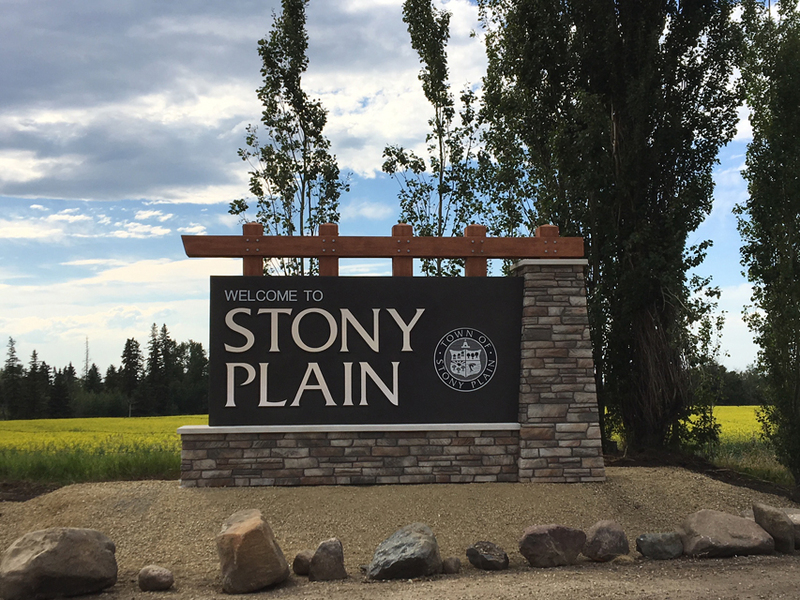 “I’ve had a good working relationship with the Town of Stony Plain for over twenty years, and my company has partnered with them on a variety of their projects in the community,” says Sware. After selecting Valley Traffic Systems, town administration officials, in turn, contacted Sware about what they wanted to accomplish with their new welcome signage, and he came up with ideas for them. After everything was agreed upon, Sware met with them in-person to finalize the drawings and map out a schedule for moving forward. When it came time to make their 2-D sign design a 3-D reality, town officials told Sware that they wanted the pair to match the look of the rock that the town had used for the exterior of their new community building. Valley Traffic Systems has enjoyed a partnership with EPS foam manufacturer Signs By Benchmark for many years and brought them onboard the project to help fulfill this request. 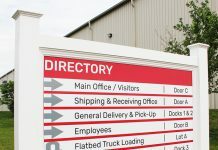 Aside from the aluminum copy and plaque, everything you see on the signs’ exterior was constructed by Signs By Benchmark. 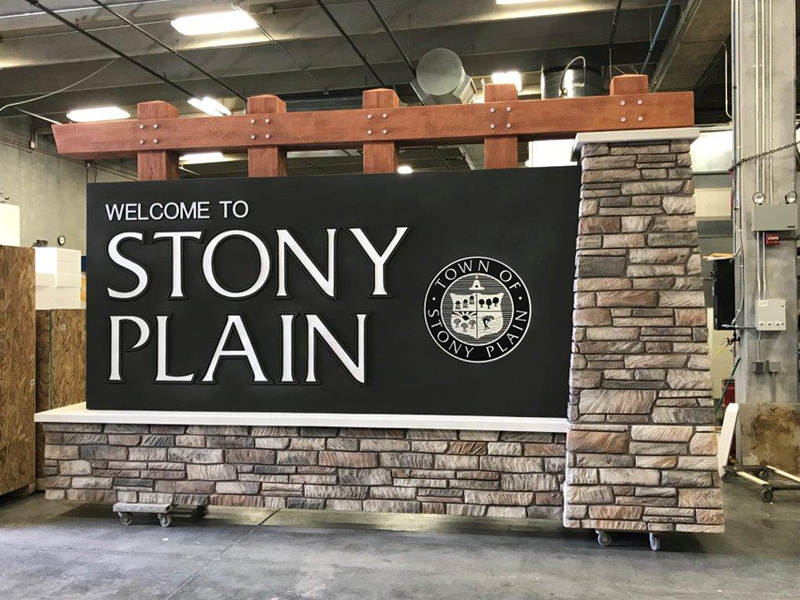 After being given pictures of the stone and wood that the Town wanted to match with this custom monument sign, Signs By Benchmark developed a color palette that closely resembled the actual finishes. “To ensure we had a match, we sent samples of the finishes for approval, prior to production,” says Signs By Benchmark Senior Designer Jamie Kakacek. The frame for the top section was made out of tubular steel. Signs By Benchmark outsourced this portion to a third-party specialist since they don’t have a lot of metal capabilities in-house. During assembly, they easily cut around the framework and built the EPS foam around it. “Most of the cutting was done by our CNC hot wire machine, although we did employ a few hand cuts,” says Kakacek. 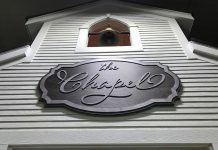 The face of the sign was made with a one-color finish, while the EIFS stone and timber elements were all hand-applied using multiple colors. “The expert craftsmen at Benchmark did a fantastic job [replicating] the look and feel of the requested stone appearance,” says Sware. Gemini supplied the aluminum letters featured on the face of the sign. The “Welcome To” letters are 5.2 inches tall, the “Stony” letters are 22.6 inches tall, and the “Visiting” letters are 10.3 inches tall. 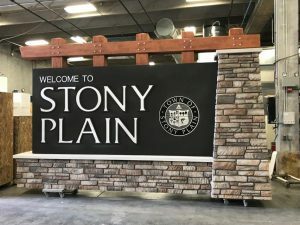 During the design stage, the topic of visibility during non-daylight hours was brought up, and the Town of Stony Plain decided that they wanted the sign to include reflective qualities. With that in mind, Valley Traffic Systems offered the option of Avery Dennison vinyl reflective letters to satisfy this requirement. The “Stony Plain” letters were covered in Type XI OmniCube reflective sheeting. 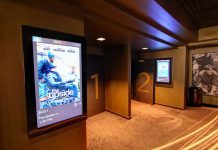 “This product’s exceptional reflectivity and consistent performance allow us the flexibility to provide a visibility solution to clients, since there is no power at the installation site,” says Sware. Gemini also created the aluminum plaque featured on the right-hand side of the sign face. Signs By Benchmark used a template plaque that was sent to them by the Town of Stony Plain. “After some minor cleaning up to make it more production friendly, we had Gemini mill the plaque out of aluminum,” says Kakacek. 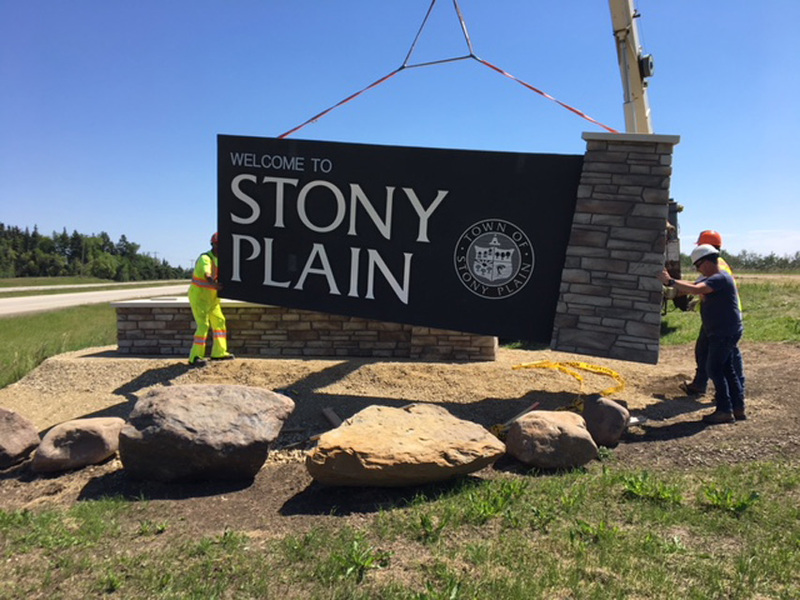 The reflective “Stony Plain” aluminum copy was stud-mounted to the face while the plaque was mounted to the sign using studs and adhesive. 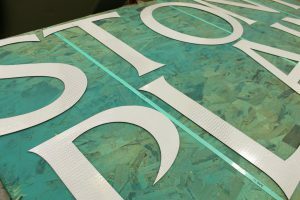 The upper woodgrain section of the sign has an internal frame that is sleeved into the main body of the sign. “It was made so that the frame would nest over the poles before locking it into place,” says Kakacek. To help with both shipping and installation aspects of this project, both welcome monuments were actually constructed in three sections—the top woodgrain section, the sign face and column, and the base and bottom portion of the sign. (Note: Two sections would have still been too large to ship to the install site in an enclosed van.) “We had some natural break points on the sign, so any seams were pretty well hidden,” says Kakacek. Once the signs were assembled, Signs By Benchmark encapsulated everything in its polyurea hard coat finish. “This completely seals and protects the sign from the elements, as well as provides a base material to apply the stucco finish,” says Kakacek. Everything was shipped to Valley Traffic on a dedicated truckload. “The two signs took up the majority of a trailer so we didn’t have to worry about any damage along the way,” says Kakacek. Valley Traffic Systems used a boom crane truck to lift each section into the air, while they guided them into place.